Porto Alegre/RS, Brazil, which I could attend with the help of the organizing committee and our generous sponsor Carlos Leonhard Woelz, the man behind the KDE Quality Team. 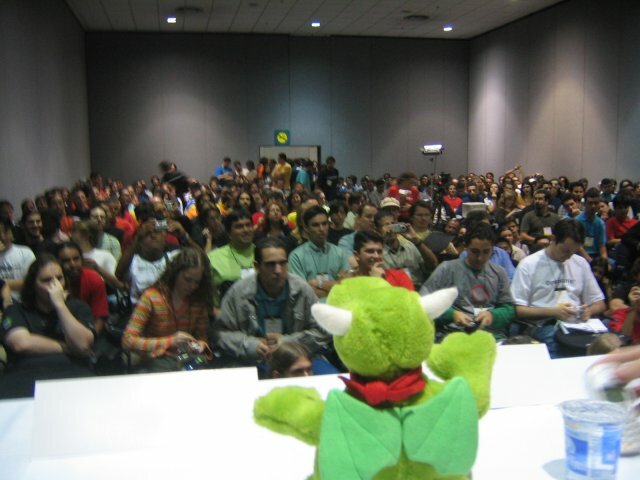 The forum is the biggest open source/free software forum in Latin America, and it has more and more visitors each year. There were more than 3000 registered in advance participants and with well known names from the free software community like Eric S. Raymond, John "maddog" Hall, Randal L. Schwartz, Marcello Tosatti and others, including the LinuxChix. The event is a combined exhibition and talks, an exhibitions which this year big companies wanted to be and are present, like IBM, Sun, UniSys. There are also a number of booths belonging to the Brazilian federal and local government. For free software groups and organizations free booths were offered, so there is a small KDE booth as well, mainly run by local KDE enthusiastic and developers, like Helio Chissini de Castro and Thiago Macieira as well. Helio participated on a discussion about object oriented programming, while I gave a presentation about how can one adapt Quanta Plus for his own needs. The slides for my presentation are downloadable in KPresenter format. As there are many talks in parallel it is hard to follow all of them. You can watch them as they are broadcast on the internet. Most of the talks are in Portuguese, but there are live translations offered to visitors for most talks, so English speakers can understand Portuguese talks and vice versa. If you were not yet aware of this forum and the live broadcasting, you can still see some interesting talks from the last day of the conference like Eric S. Raymond's about "The Cathedral and the Bazar", Leon Shiman's about MAS or John Hall's about pirated software. The conference is hosted in a private university, which offers the infrastructure free for the organizers. Aside of the big hall for the exhibition and the booths there are many conference rooms, free and fast internet connection for every visitor, free lunch for invited speakers and free shuttle from hotels to the location of the forum. As I did not have yet the time to visit the city - but will do after the event with the help of the organizers - I can give only my impressions about it as I saw from the bus and the area around the hotel and the forum. The people are very nice and helpful, even if they don't speak English in general. German and Italian speakers might have an advantage in this area as according to Helio, many of the inhabitants have German and Italian roots and they still speak the language. The climate is nice, even in this part of they year, which is the beginning of the winter. The food is great, and usually you can a lot for relatively little money. The government seems to be very interested in free software and this shows up not only from the fact that they are present here and supported the event, but also they are using open and free software in their projects, like managing the health system of the whole country, which has around 200 million inhabitants! In a follow-up of this report Helio will present more about who was present here and what do they shown and talked about as he is a native Portuguese speaker and also a local person, who knows many of the exhibitors and the government representatives. As a final note some words about the future of the forum and it's possible relationship with KDE. The local KDE developers would like to host next year's KDE conference here in Porto Alegre together with the FISL 7.0, a good opportunity to show KDE for a lot of people, both simple users as well as important companies and government representatives. Based on the reception of the current event, I'd say that KDE would benefit from it a lot, and that it would get quite support from the government and the companies as well to make this possible. You can see some pictures as well. More will come later. KPresenter file format? What about PDF? I believe you that KPresenter is a very nice program and has a very nice file format. I would *love* to look at the presentation. But I can't, currently. Because I am on Windows. I guess a *lot* of people who read the Dot can not look at the KPresenter file on the spot. (And they may loose interest later). Unfortunately KDE is not yet in the powerful position to set the standard. So please consider to convert your presentation slides into PDF. Offer that format and a link to it as an alternative. (However, do not switch completely to it -- that is not what I am asking for.) That would ensure that everybody can look at them, from all platforms. Re: KPresenter file format? What about PDF? I used KPresenter and I published the file as it was used for the presentation. I'm sure that many readers of dot have it or can easily install it. - the PDF is large. As it is slow to generate on this machine, it will not yet be visible when I post this comment. I didn't had money to go this year (universty is expensive). I was expecting to see Andras talking about Quanta, a tool that I'm using for years and that I love. Maybe luckly, they will put the videos online, I even wasn't able to see the broadcast because I'm moving to another part of the city tomorrow and I was trying to have eletricity on the new address. Anyway, I'm happy at least you this dis great review and put the presentation online Andras, thanks you very much, and I hope you liked Brazil. Thanks for the report and the pictures. I tried accessing the live stream but well, the demand for streams had been underestimated. Porto Alegre is a very nice city and worth more than one visit (note to self: make travel plans for 2006).